Romantic and historic Casa Cody Inn is the oldest operating hotel in Palm Springs. Designated as a Class I Historic Site, it was founded in the 1920’s by the beautiful Hollywood pioneer, Harriet Cody, cousin to the legendary Buffalo Bill. Casa Cody is nestled against the spectacular San Jacinto mountains in the heart of Palm Springs Village. Casa Cody features adobe hacienda architecture. Its decor is inspired by Santa Fe and other desert cultures. Twenty-nine ground level units, many with private patios and fireplaces. Kitchen, DirectTV Satellite Television, private phones, and Wireless Internet. If you’ve come to relax, you’ve picked the right place. 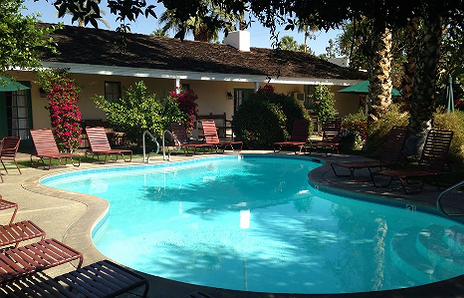 Casa Cody is a friendly quiet B&B Country inn, in the prestigious Tennis club area of Palm Springs, California.